At night a projection from a moving car is shone on the buildings. 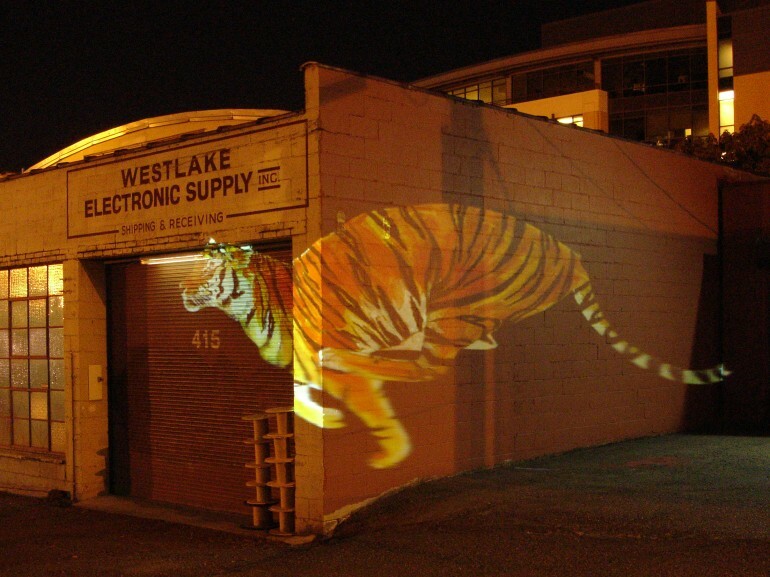 The projection is an animation of a tiger. The animal s movements are programmed to correspond to the speed of the car: as the car moves, the tiger runs along it speeding up and slowing down with the car. As the car stops, the tiger also stops. Projection disappears and fl ickers as it is supported by the architecture. The city itself is an active partner in creating this alter ego. We are elevated from the everyday reality through this element of fantasy into a world with more dimensions, possibilities and perhaps beauty. Karolina Sobecka works with interactivity, installations, video, animation, and other new and old media. Her art and design are daily attempts at making our world more beautiful and meaningful. Her artistic interest is strongly stimulated by the advances in science and technology, which shape our understanding of ourselves and our world. Karolina was born in Warsaw, Poland, got her BFA from the School of the Art Institute of Chicago, and her MFA in Experimental Animation and Integrated Media from the California Institute of the Arts. Her work has been shown at festivals and galleries around the world, most recently at ISEA2006, Trampoline Festival, Nottingham, UK, and New Forms Festival, Vancouver, British Columbia.